We have embraced technology with open arms and hearts believing it can make our lives much easier and faster. Things have absolutely sped up, but so are their debilitating effects on our health. Sitting for too long in front of computer screens have largely increased the cases of obesity, cancer, diabetes, and other health risks related to a sedentary lifestyle. And too much screen time has led to eye strain more than ever. Computer fatigue brings discomfort. It can drain your energy levels, strain your eyes, and mess with your brain. 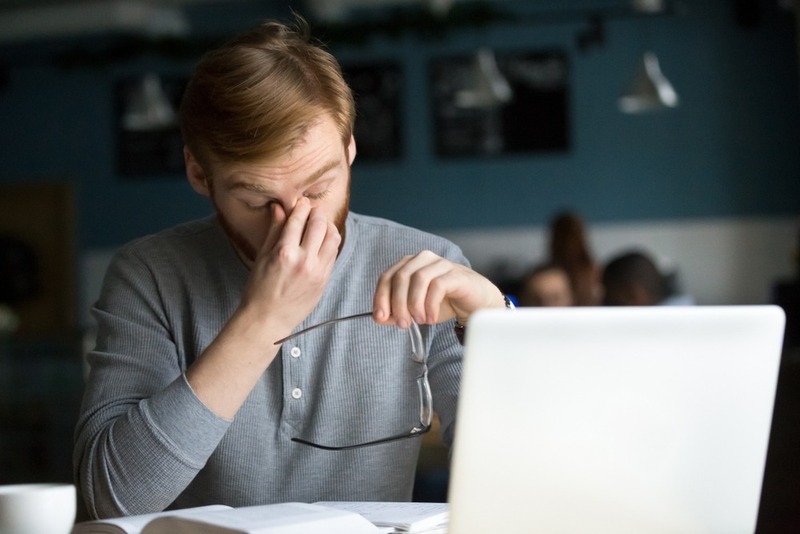 Eye strain comes with a variety of symptoms including physical fatigue, decreased productivity, increased numbers of work errors, eye twitching, and red eyes. A reduced time spent in front of the screen may be one way of solving your health issues regarding computer usage. But how about if your career or business lies entirely on your computer? Giving up that one income generating activity surely would not be your best option. Most of us use laptops wherever and whenever we want. We do it either sitting, reclining or even lying, whichever feels convenient. However, the correct sitting position matters most. 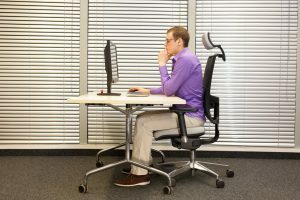 Even if you’re not working on your screen for hours, improper sitting position can put undue stress on specific parts of your body and can likely lead to physical fatigue and strained muscles. Turns out, the best spine friendly position is not sitting uprightly when working on your computer. It’s the angle somewhere between 120 and 135 degrees where your shoulders are relaxed, forearms and arms are parallel to the floor, feet flat on the floor, and the top of the monitor is on eye level. A standing desk is also another best alternative. Standing desks enable you to take frequent breaks and improve your posture. Taking frequent breaks from your work may seem counterintuitive, especially when your work needs more focus and deep concentration. But it works the other way around. The more you spend a long time on your computer without taking breaks, the more you’re hurting your focus and concentration. Your brain and body will benefit more when you take frequent breaks to take a few paces or do some stretches. This encourages more blood flow to the brain, which can refresh your mind. Getting up once every hour helps your blood to circulate. Keeping your blood in proper circulation is one way of staying healthy. You can also use your frequent breaks to refresh your mind and get mental clarity. Look outside your window and watch the people passing by. A green scenery outside can help reduce the strain in your eyes. Talk to someone or even your pet. The point is to shake your mind for increased clarity and focus. The 20-20-20 tip may also help you. For every 20 minutes, you have to look at something 20 feet away and gaze at it for 20 seconds. This is not only good for gaining clarity but for relaxing your eyes as well. When working on a screen, your eyes are the most affected. It might be easier to notice when you’re feeling physically fatigued but may fail to notice your dry or tired eyes. Strained eyes also manifest itself through physical fatigue and muscle twitching. Red eyes are the most recognizable effect. One of the main causes of eye strain is a bright overhead light. Working under the sun or near bright sunlight can also have devastating effects on your eyes. It will take more work for your eyes to adjust and read the screen under these bright lights. Use curtains to block the sunlight or other bright lights coming from outside. If possible, work under dimmer light. Adjust the brightness of your screen. It’s ideal to match the brightness of your screen with the brightness of the light in your room. Walls that are painted white can have a glaring effect on your computer screen, which can increase eye strain. Avoid working in a brightly painted room. Consider painting your office with a darker color or better yet, install an anti-glare screen on your monitor. Old computer monitors have a noticeable flicker of images on it, which can cause eye strain. Try replacing your old monitors with LCD screens. They are more eye friendly compared to the old ones. Enough amount of brightness on your screen should match the amount of brightness in your surroundings. This reduces eye strain because your eyes will have no difficulty adjusting from the screen and the surroundings. Some people want to get creative and go to the extent of creating the wrong combination of font colors and background. Since your eyes are well adjusted to black fonts on a white background, having white fonts on a black background would not suit your eyes best. The right combination that is comfortable to the eyes should be your main concern when following your creative impulses. Orange and red are short wavelength blue light that can cause more eye strain than other colors. Reducing the temperature of these colors will also reduce eye strain. If possible, use orange and red colors on your screen at a minimum. Cutting back on computer screen usage at least thirty minutes before bedtime is the simplest and easiest way to reduce eye strain. Blue light is the color generated by computer monitors, smartphone screens, and other digital devices. Prolonged exposure to blue light can strain the eye. If you can’t possibly be away from your screen for a longer time, you can protect your eyes from overexposure to blue light by using glasses that block this light.